The Sims Metal Management UK Metals business unit (Sims UK), part of Sims Metal Management Limited, the world’s leading publicly listed metals and electronics recycling company (Sims), is expanding its UK capabilities, with a new dedicated scrap metal handling facility at Peel Ports London Medway, through its sole UK trading subsidiary Sims Group UK Limited. This new facility will grant Sims UK the ability to expand UK deep-sea shipments of scrap metal to markets across the world. Globally, Sims recycles and recovers 8.7mt (million tonnes) of scrap metal a year — nearly 1.6mt of which is handled in the UK. The new facility at London Medway will have the capacity to handle 300,000,000 kilograms a year for Sims UK and is now fully operational. Alistair Field, Group CEO and Managing Director, said: “This facility is a great opportunity and an integral part of Sims’ strategy to grow in its current markets.” With an annual turnover exceeding ZAR 56 billion in 2017, Sims operates from more than 200 sites spanning five continents, with over 35 metals recycling sites in the UK. Globally, the Sims business reflects 100 years of experience in metal recycling and leads the way in technological development to achieve higher recycling and recovery rates. 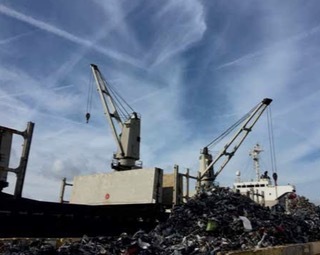 Paul Wright, Managing Director – Sims UK, said: “As a company we are committed to improving recycling and recovery rates for scrap metals and we’ve identified Peel Ports London Medway as a key partner to facilitate our growth. The ports of Sheerness and Chatham form the core terminals of Peel Port’s London Medway cluster, named to reflect their proximity to the UK’s capital city. London Medway handles 3.1mt of cargo annually, across a range of commodities including steel, agribulks, forest products and automotive. Paul Barker, Port Director at Peel Ports London Medway, said: “This newly formed partnership between Peel Ports and Sims Metal Management heralds a new direction for the business, with the launch of our first ever scrap metal facility at Sheerness. Sims is a renowned for the secure and sustainable management of recyclable metals from industry, trade and the wider community. Globally, Sims specializes in turning vehicles, machinery, building materials and a whole host of other domestic and industrial items into specification-grade raw material commodities feeding steel mills and smelters, which turn those raw materials into the manufacture of new products. Recycling of metals saves energy and reduces the environmental costs usually associated with producing materials such as steel, copper, and aluminium from virgin sources.